1. Preheat the oven to 200˚C, gas mark 6. Place the ciabatta in a large bowl, add the oil and sumac and toss well together. Spread out on a baking sheet in a single layer, then bake for 10 minutes until crunchy and golden. Leave to cool. 2. Toss together the avocado, cucumber, artichokes with their dressing and the vinaigrette. 3. 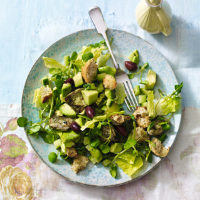 Place the lettuce and watercress in a large salad bowl and spoon over the avocado and artichoke mixture. Scatter over the olives and croutons and serve swiftly. Sumac is a citrusy-flavoured berry commonly used in Middle Eastern dishes. It can be replaced in this salad by ground coriander.